Wouldn’t all your sci-fi dreams come true if there was a celestial body, other than Earth, we could live on, or at least where alien life was found? Well, in a supercool discovery, astronomers from Europe have spotted a planet, Ross 128 b, close to our solar system, about 11-light years away, with a temperate climate and sized similar to Earth. But what seems to have caught the interest of experts is its possible habitability. As published in the Astronomy and Astrophysics journal, HARPS (High Accuracy Radial Velocity Planet Searcher) was used to detect the atmosphere of this terrestrial planet, and it has been measured as the second-closest identifiable planet to Earth. Ross 128 b is named after the great American astronomer, Frank Elmore Ross. Can This Planet Support Life? In 2016, Proxima b, a planet much nearer to Earth was located but it was deemed inhospitable to life due to the fact that it orbited an active ‘red dwarf’ star, Proxima Centauri, which releases harmful radiations on eruption. So, what happens here is the narrow temperature belts where living things can potentially survive, circle close to the star and thus have to bear the brunt of exposure to ultraviolet- and X-rays. Now, with Ross 128 b, although it is in close proximity to a red dwarf, it is atypical in the sense that the host star is quiet, less volatile and not expected to blast the extrasolar planet with irradiating flares with as much aggression. In fact, it has been calculated as just 1.38 times higher than what the Earth receives. “Just because Proxima Centauri blasts its planet with strong flares and high energy radiation, yes, I think Ross 128 is much more comfortable for the development of life”, said Nicola Astudillo-Defru of the Geneva Observatory, Switzerland, to BBC News. 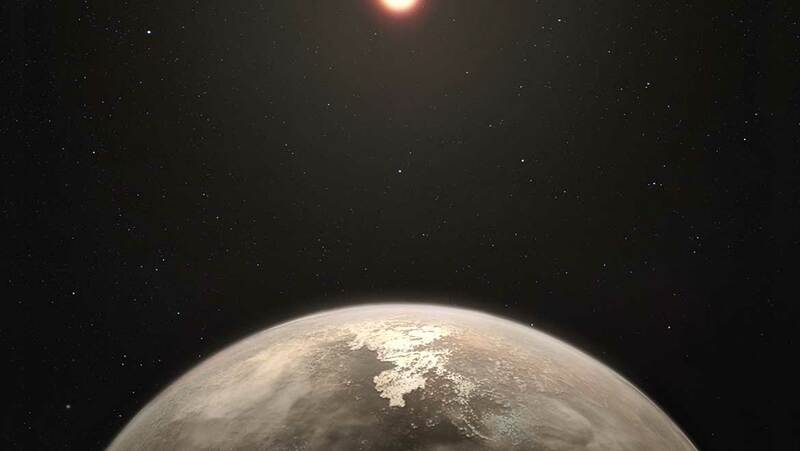 Another major development, the team mentioned, was that this exoplanet is moving towards Earth, and could, in the next 79,000 years, be our neighbor. Ironically enough, earlier this year, researchers picked up certain signals emitting from the direction of Ross 128 but dismissed it as likely from manmade satellites around Earth! Astronomers are hoping that, in the years to come, the powerful telescopes like the Extremely Large Telescope (ELT) and the James Webb Space Telescope (JWST) could provide some answers, and also to study the kind of environment that Ross 128 b holds, the composition of its clouds, and if there is the presence of any oxygen and henceforth, life. But for now, we’ll have to just settle with the idea of its promising discovery!